Spray 3- to 4-quart slow cooker with cooking spray. Remove skin and any fat from chicken. Brush chicken with dressing; place in cooker. Sprinkle with Italian seasoning, salt and pepper. Top with remaining ingredients except parsley. Cover; cook on Low heat setting 4 hours 30 minutes to 5 hours 30 minutes. Skim off any fat from top of mixture in cooker. Serve chicken and tomato mixture in shallow bowls; sprinkle with parsley. 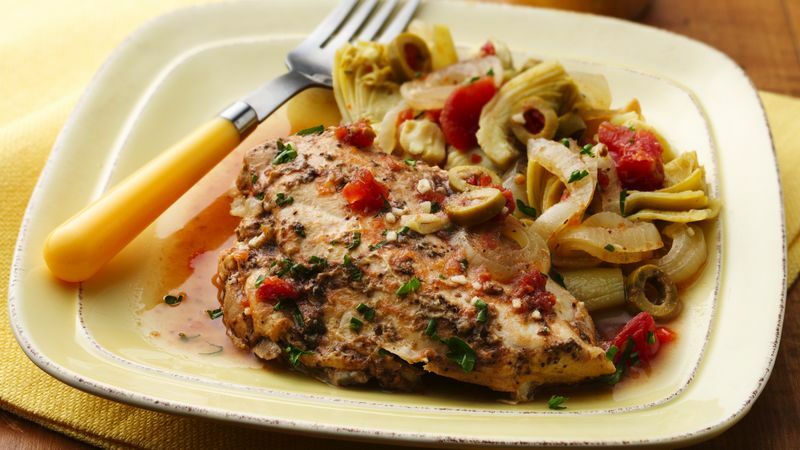 For an easy side dish, serve this chicken with your favorite instant rice pilaf blend. Use a slotted spoon to remove this dish from the slow cooker if you’re serving it on plates rather than in shallow bowls.